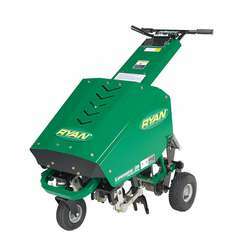 Self-propelled precision high-speed turf aerator. 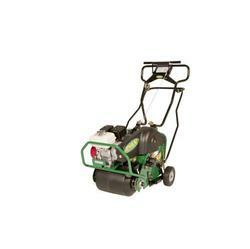 Choice of 4- or 6-hp gas engines. 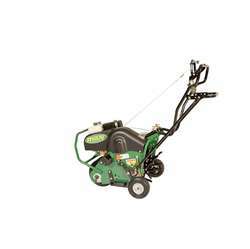 Up to 2-3/4 inch soil penetration. 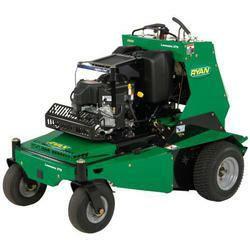 Easy to use, self-propelled lawn aerator ideal for equipment rentals. The NEWLY redesigned tine assembly allows the user to steer the unit without taking the tines out of the ground. Each tine assembly rotates independently. Higher productivity and less physical stress on the operator. Plus all of the same valuble features as the Lawnaire IV & V Plus. The LAWNAIRE 28 (LA 28) vertical coring aerator delivers value by saving your business time, money and effort. 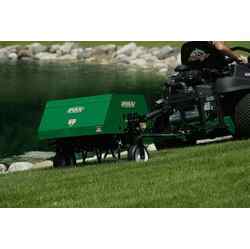 Simply stated, the LA 28 pulls the optimum number of cores in less time than other walk-behind aerators on the market. Engineered for performance, dependability and low maintenance, the LA 28 is built with heavy gauge steel throughout and sealed precision bearings. An ergonomic design ensures operator comfort and higher productivity. Pulls cores even in difficult soil conditions. Produces more holes in a single pass. 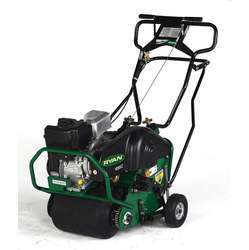 Self-propelled and easy to maneuver requiring less effort. Vertical coring the turf is ready for play more quickly. 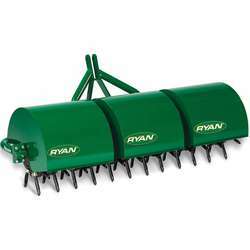 Effective in reducing soil compaction. 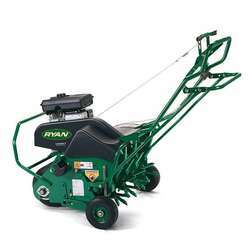 Rugged towed aerators for all terrain and soil conditions, with coring, slicing or open-spoon tines. Hydraulic or Manual Lift or Optional Electric Lift. Coring, Slicing or Open-Spoon tines available. Category "0" or "1" Three-point Hitch . 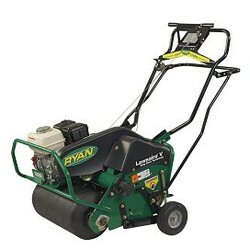 6' Aerating width with speeds up to 4 mph. Weight trays can hold up to 100 lbs eache for maximum penetration in heavily compacted areas. Mounts on Tractor with a Category "1" 3-point Hitch.